The only native trout in Yellowstone National Park are Yellowstone and Westslope Cutthroat, and Arctic Grayling. 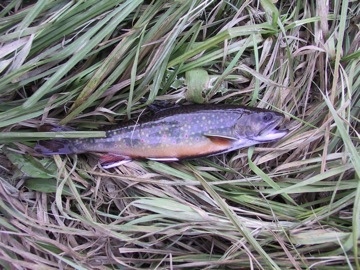 Over the years those species have been reduced in population due to competition, predation, and hybridization due to other introduced trout. It’s happening in Idaho right now. I saw that too and thought about posting it. I think it is a good idea myself but I wonder how successful it will be. In fact, the Yellowstone cutt and the brown photos I posted are from the SF Snake River. In my experience, speaking with folks who fish the S. Frk of the Snake, and granted, my sample size is not huge (all though I do travel to fish it 4 hours one way at least twice a year), but they would just as soon catch rainbows and therefore are releasing them to catch them again. In addition, in my sample, the folks don’t need the money and would not inconvenience themselves with the process to get it. Personally, I don’t like the taste of trout but kept every rainbow I caught last year out of the S. Frk and had no trouble finding someone to eat them. I was told it was illegal NOT to keep them last year by my fishing partner whom I consider an expert on the river. Fish restoration is an imortant undertaking and a lot of fishery folks under estimate the ability of non native fish to migrate over too low, too narrow migration barriers. Then they don’t get all of the nonnatives out of the stream. But without spending the money to build good barriers, all of the hard work goes for nought. I wish them succes. It sounds like a great idea—i hope they study it well before implementing it. I took a great class through the Yellowstone Institute on this very subject. We went out on the boat and netted Lake trout with the biologists—-it is a losing battle, but a battle that needs to be fought. Anything that boosts native numbers will help. Hopefully, they will get something going that has a high effectiveness/ low cost ratio. never be rid of it. It has taken over and has displaced tons and tons of native species of plants in the region. It has a chemical defense so that goats are about the only animal that can eat it. As more and more of these invasive species move around the globe, the ecology will change. It is possible that there might be enough of a change to small plant life that insect life will be significantly affected in certain areas. Many plants, including some trees, have a symbiotic relationship with insects and cannot reproduce without their symbiotic partner. So even though a tree is slow growing and we can thin competing trees, some species will not be able to grow since an insect on which it depends might be in sharp decline. This will go on and on in the microbiological world too. Life on the planet will survive but it will be with many fewer species. Also, the human race will be forever trying to control invasive species and their effects to preserve the diverse species that we have. Many will not want to go the the trouble citing supernatural or economic rationale. Of course, this global change of invasive species will happen slowly over centuries so we will not see alarm bellsngoing off as we did with global warming. Wasn’t it 15 years ago that leafy spurge invaded from Ashton and Warm River west to Mud Lake and and beyond? That’s how it seemed to me. I do have the impression (mistaken?) that since it has been brought under control a least a little bit. “cutthroat are an important food for grizzly bears, otters, bald eagles and other animals. The cutthroats demise together with the extinction in YNP ecosystem of Whitebark Pine, thought to be imminent by some conservation biologists, could be a double whammy that has significant effects on grizzly bear recovery. 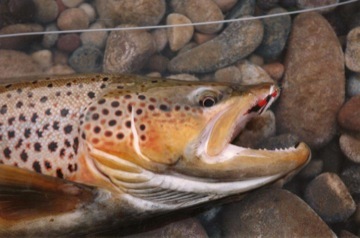 If these efforts are not successful time will tell just how much “harm” the introduction of rainbow trout will have had. Yes…I have read about the problems with the decline of cutthroat. I did not mean to dimimish the importance of controlling non-native species. I meant that a rainbow is not like watermilfoil or something that will completely destroy the fishery in some lakes. My understanding is that Leafy Spurge is moving all over the West and Midwest. It was in both Island Park and Yellowstone Park last summer when I visited. It seems to like semi-arid habbitat so in high altitudes, such as in Yellowstone, it will only be on dry southern exposures or at lower altitude. I believe they have found ways of combating it. One is goats. I think I heard that Fremont County hired or permited some goat hearders to much highly infested areas. Another is air-dropping insects from Russia (Aphthona Nigriscutis and Lacertosa) that eat it and reproduce quickly. But I saw it everywhere last summer. It can be a pretty little plant in the late afternoon when the sun is filtering through its yellowish flower. I’ve never seen Harriman State Park more beautiful. I think it is a sickly looking yellow. Folks should know its sap can blind you if you snap off a stem and it gets in your eye. I have a photo of it up on Google Earth. The photo shows it making its ugly appearance in Antelope Canyon northeast of Arco. I also have an unposted photo of spurge and spotted knapweed struggling for space at a Montana rest area on I-90. The spurge was winning! I’ve also noticed that some kind of floral spurge has started showing up in home gardens in northern Utah and SE Idaho. It spreads too. I recently saw a patch of it growing next to a dirt road in City Creek above Pocatello, ID. I don’t know its name, but it never should have been allowed in for planting. Here is a little pdf about efforts to combat leafy spurge. In the lower right is a map of the area showning known infestations. It all over the valleys and main roads. Here in Bannock County, Idaho, the County commission paid citizens to gather the weed. There was a big response and they soon ran out of money. Unfortunately a one time effort only sets it back for one year. …and the only thing they could do to set it back is to introduce an inscect from Russia that is genetically disposed to consume it or to use goats, from the middle east, who are aslo genetically disposed to consume it. So one species requires another to keep it in balance. Where is it going to end. Since deer and elk cannot eat it, it has already reduced deer and elk populations in the region since leafy spurge displaces vegitation that deer and elk can browse. It is the habitat, both the quantity and quality, that governs wildlife populations over time. I don’t understand why people are so worried about wolves. Leafy Spurge has become a LARGE problem in Adams county (and some of Washington), especially between Weiser and Council. The bugs that Pointswest mentioned have been gathered in Montana and brought to several disbursment points in the Cambridge area. Not much success yet. The goats do seem to work, but the area that they can be effective in is pretty limited. Just not that many goats. It’s thought that most of the infestatations came from planting other kinds of Euphorbia that had the bad variety mixed in. These other kinds, by the way, are still on sale at some ornamental plant outlets. Point well taken. Looking again at your entire post I understand what you were trying to convey. When I was a boy in the 1960’s, we would go on a three or four day fishing trip to Yellowstone Lake every summer. We would camp at the West Thumb camp ground and fish from a boat usually around Frank Island or Dot Island. We would have four adults and four boys. The limit was eight fish (all were Cutthroats) and we would limit out everyday…that is 64 fish per day. We would usually not keep anything under 12 or 14 inches and we usually had our limit before noon. The Yellowstone Cutthroats were large enough that they filleted easily and we’d have a big fillet fish fry every night. This was a time when bears were everywhere in the West Thumb camp ground and we would see several everyday in the garbage cans and restrooms. Those were the good ol’ Yellowstone days that are gone forever. I have a picture of me and my brother at Lake in 1958 with our limit, three fish each, I was seven and my brother was six. The limit then was three fish per person. Are you sure about eight fish? If not we could have another thread about you proaching. I am pretty sure it was eight. There was not very much fishing pressure on the lake. Once out in the lake, we would seldom see other boats. The summers are short too. Biologists were more worried about pelicans who were thought to be eating 6000 cutthroat per day. I know three is not correct. I can remember well when the possession limit was reduced to two in the late 70’s (or maybe early 80’s). People who used to fish the Bechler or upper Fall River regularly complained it was not worth the trip anymore. Others pointed out that you could still eat all the fish you wanted, you could just never possess more than two. I know all this complaining in the late 70’s wasn’t the result of limits dropping from three to two fish. I am pretty sure that it was eight fish and you didn’t even need a license in Yellowstone. 5 fish in the late 60’s. I believe 5 in the late 60’s but I think my first trip was probably in 1962…the same year as the Seattle World’s Fair. That is how it started. My father bought a travel trailer to go to the fair in 62 and his friend had big boat. Our two families (less the girls) started taking the boat and travel trailer to the lake. But I still have it in mind that the limit was 8 in the early 60’s and we would limit out before noon everyday. Elk/PW, during that same period of time do you remember walking along those feeder creeks that dumped into the lake early in the year, they would just be alive with spawning Cuts. No…we only went once a year after it had warmed up, probably late July or August. I remember swiming in hot springs on Frank Island and some of the nearby warm springs having so many tadpoles that the water was black. One year there was a buffalo stranded on Dot Island that had walked out on the ice. Apparantly the lake froze before there was much snow. We heard that there were also two elk on Dot but they swam back to the mainland (probably a good two miles) about two weeks prior. I can remember the kokanee spawning up moose creek in Island Park and catching them with nets. Some were four and five pounds and would scare me out of the creek when they came charging. I remember fishing Clear Creek in 1965 and the water moved with cuts, hundreds and hundreds. The same as Reds in the Bistrol Bay area. 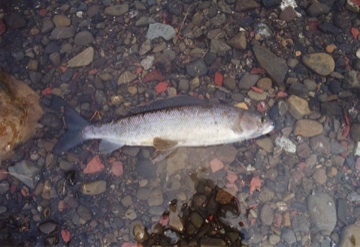 I see the day, if the mine is built Bistrol Bay will be like Clear Creek is today — very few fish. I helped build the bypass around West Thumb in 1971 and 72. We would work 7 days a week and on Sundays when no one was around, there was a spawning creek near by. About lunch time someone would scoop up a 1/2 dozens cuts. We were burning slash and with tin foil, butter, salt and pepper we would have fresh fish at noon. I happened to speak to someone else who went on these fishing trips to Yellowstone Lake in the 60’s and she thought the limit was six or eight. I remember catching lots of fish…having two or three on the lines at one time and getting tangled was a constant problem. The limit at Fishing Bridge might have been three but I am pretty sure the limit on the lake was at least six or eight. I remember everyone trying to keep track of how many they’d caught and it not being easy. But even if the limit was four (and I am almost sure it was not), we still threw many back because we would reach our limit so early in the day. Our best hope is technology. Maybe a small robotic submarine can be developed that could identify Lake Trout and kill them. Invasive fish in large lakes is a real problem world wide. In some cases, an unwanted fish has destroyed a hundred million dollar commercial fishery. So there is an economic incentive to develop such high-tech kit. The other Spurge you are talking about is Blue spurge(Euphorbia myrsinites),see http://www.flickr.com/photos/bryanto/3449586800/ ,which is sold in nurseries as an ornamental plant. It has been made illegal to sell in Salt Lake County,Utah recently,but not in the whole state. The problem is there are no laws to regulate non-native plants as ornamental species,and no one thinks about if it will jump ship,only if they can sell it and make money. So they only get listed after their is a problem. Back to the trout,I have been practicing a keep the non-native,release the Cutthroats for years. If every fisherman would do that it could have a serious impact on their populations. 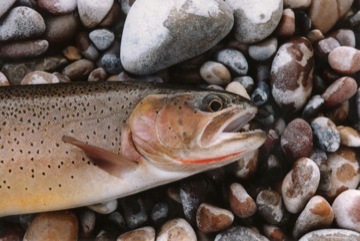 Fortunately the western states are doing better at protecting our native trout, rather just managing everything for planter rainbows and Browns like they used to do,mostly because of fear of Cutthroat being listed as endangered. Yellowstone/Tetons is the last great mostly pristine Cutthroat Trout fishing waters in the west,and every step should be made to protect and enhance that. I think that unless it is a heavily fished stream like the South Fork of the Snake, the Henry’s Fork, or the Madison, fishing regulations or catch and release habbits have little impact on fish populations. There have been studies that draw this conclusion. Good trout streams can have thousands of fish per mile and they can grow an inch per month. A few fisherman coming through for a few weekends in the summer has little to no impact on populations. Yellowstone Lake’s problems had nothing to do with the fishing pressure. The fishermen’s catch in the few short months of summer was nil when compared to the estimated 9 million cutthroat that once populated that lake. Thanks for the great fish pictures! The idea of removing introduced fish species to preserve native species in NP’s is not new. I remember many years ago Rocky Mountain NP was trying to increase populations of the greenback cutthroat (ESA threatened at that time, and still is today), the only native cuttrhoat to the South Platte (specifically the Big Thomspon R.) River basin. This would have resulted in large planned kills of rainbows, german browns, and other cold and a few warm water species present throughout the upper basin streams. Colorado Division of Fish and Wildlife had a tough time with that because any poisoning efforts undertaken by the NPS would have affected their downstream stocks, as the toxin moved through before it neutralized through chemical or dilution processes. 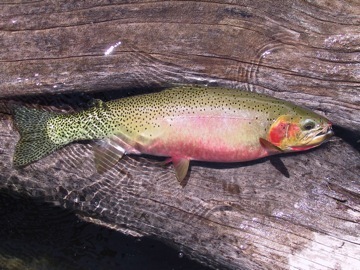 Then there was the problem of the non-native species repopulating the areas killed off because there were no physical barriers to prevent the non-natives from heading back up stream to the specialized habitat of the greenback cutthroat who would once again become prey to their more resilient non-native cousins. I don’t know what the final outcome was, or the situation is now. Certainly alot of tension between the NPS and CDW. In all candor, the sport fishers wanted the rainbows and browns, and could care less about the greenbacks, which they couldn’t keep anway because of ESA status. Fastforward in time, and values have changed some today, as there is more appreciation of a catch and release fishery. Keep the rainbows, etc., and return the native greens. Here’s another map – it shows Leafy Spurge distribution in the US. Not just a Northwest problem by any means. Pointswest, I read with interest your link on leafy spurge. It mentions reduced habitat, where did it mention reduced deer and elk populations?